Published: Jun 20, 1992 to ? Beyond this world lies the realm of the Twelve Kingdoms. There, the laws of nature are governed by the Way—a moral code established by the Mandate of Heaven—that causes kingdoms to be ravaged by war and famine when an unsuitable ruler is upon the throne. Babies are born from eggs on trees, and mythical creatures roam the land. When a temporary breach is created between that world and Japan, Youko Nakajima is dragged from her mundane daily life as a high school student and finds herself in a situation far less appealing than that of a fairytale. Once a model student who always conformed to societal pressures, she is now abandoned and pursued by men and beasts alike in the wilds of a land unbound by any earthly sense of order. Struggling to come to terms with these strange new laws as well as the lack of kindness in the people around her, Youko must learn to make her own choices if she is to survive with any sense of integrity. Fantastical and heavily detailed, Juuni Kokuki tells the stories of Youko and other individuals forced to find themselves as they are thrust into an unforgiving and coldly beautiful world. The first four novels of Juuni Kokuki were published in English as The Twelve Kingdoms by Tokyopop under the Pop Fiction imprint from March 13, 2007 to March 2, 2010. Yoko is a high school girl with flaming red hair, going through life trying to please everyone, but inevitably failing. She is timid, deceitful, even cruel sometimes and she just wants to be liked and stay out of the spotlight. Unfortunately, living this way has the effect of making no real friends, and her red hair makes her teachers think she is a party girl who goes out at night. But suddenly, a strange man arrives with numerous monstrous creatures, turning her life upside-down and yanking her off to a strange place, and then promptly disappears. Yoko is left with a strange sword to fight for her survival in a world that mostly wants her dead. She is forced to deal with people without being able to hide behind social conventions, and as if that weren&rsquo;t enough, a strange, blue, demonic monkey keeps appearing and playing on her fears and her despair. The incredible richness of the fantasy world Yoko is thrown into draws in equal parts from modern realism, Japanese and Chinese mythology, and history. Yoko receives a sword with a jewel that functions also as a mirror, tying into the three treasures of Japanese mythology. Chinese mythology brings the story the Mandate of Heaven and the general cosmography. Japanese writing in translation is typically a bit spare compared to the lavish descriptions Westerners are used to. This is largely due to the use of kanji, which convey a range of meanings, as opposed to the English language, which focuses on one right word out of many. 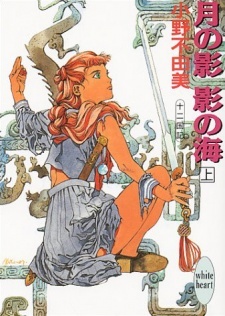 However, Ono&rsquo;s work here manages to give enough of the detail the reader wants so that the rich world of The Twelve Kingdoms comes quite alive. Few of the characters or plot points lose any of their expected vividness, and I often really did feel like I was there in the novel. The anime was routinely criticized for the confusing amount of terms that Ono made up for her world, but Tokyopop&rsquo;s localization managed to balance the vocabulary well, so that when the reader is lost in the names, it is because Yoko herself is lost as well. In fact, the novel manages to remain accessible for both readers who don&rsquo;t care about the Japanese language and readers who do by including kanji when a character is explaining something unfamiliar. I&rsquo;m not so sure about TP&rsquo;s decision to release this as a hardbound book since it might not &ldquo;cross over&rdquo; to regular young adult fiction like they think it might. You don&rsquo;t get the sense, fortunately, that Ono is trying to criticize modern life or government by proposing some pie-eyed return to a simpler time. This is not an allegory or even a rant against today&rsquo;s society. If Ono has a point to make, it has more to do with how to live life on a personal level, that, as Shoryu says, one must first be master of one&rsquo;s self before being a king&hellip;or indeed before being anything in life. Due to the blue monkey, Yoko frequently ponders moral issues and even religion&rsquo;s influence on people at one point. If there is one obvious weakness in the novel, it is that the ending might seem slightly anti-climactic. Keep in mind: this is due to the fact that this is only the first book out of at least 6 that are planned by Tokyopop. Comparisons with the anime will be unavoidable, and I certainly could not keep the images of the TV series out of my head completely, and the OST imposed itself frequently while I read. Much has been said about how the character of Asano is not expanded on in the novel, and how Sugimoto is a very minor character in the beginning, never seen again. This has the effect of increasing Yoko&rsquo;s isolation and therefore increasing the dramatic impact of what she goes through. There are few other differences, however, making the question for the anime&rsquo;s fans not &ldquo;What happens next?&rdquo; but rather, &ldquo;How will Ono take us there?&rdquo; Personally, I found the journey delightful. I think that whether you are a fan of the anime or have never seen it and don&rsquo;t want to, you will still enjoy this book enormously. The fact that the protagonist is a girl doesn&rsquo;t, in my opinion, lessen the appeal this story would have to readers of both genders. Well like the review said she's a student read hair and stuff,now then If you like to see growth in character then this is the book for you.The book in my opiniong is better than the anime in the character growth because Yoko ALONE goes though a lot of hardships and she goes through a lot worse things or it feels worse than in the anime.Also I love how little minor details you don't pay attention to end up solving some mysteries.This book is the introduction to other stories,you do have to be patient though because stories or questions that weren't answered are going to be in the rest of the book,unfotunately only 3 out of 11 books have been published so far in the U.S. so you have to be patient.Also there is little romance and it is quite long and it had small text but I believe the story itself will make up for and remember don't be annoyed by the main character in the beginning,that is the whole point of the story her growth. Juuni Kokuki is one of my favorite series--not just among manga and light novels, but among fiction in general. If you are coming here fresh from watching the anime, you'll find the novels even more enjoyable. Here I will be reviewing the entire series, not just the first novel. Unfortunately, Juuni Kokuki is not a complete series. But according to recent tweets on the author’s twitter account, Ono Fuyumi is working on another novel, which is exciting as the last one in the series, released in 2001, ended with a cliffhanger of sorts. Don’t let it’s incomplete status deter you from reading it, though–Juuni Kokuki is a truly excellent series. In some ways, it reminds me of the Narnia series, as it is a kind of spiritual fantasy, but instead of promoting a Christian worldview it explains the Buddhist/Daoist worldview of Chinese religions. Unlike Narnia, the characters have to undergo intense personal trials to reach their goals, and the novels ask the question, ‘What is the meaning of human suffering?’. Youko, the main character for much of the series, is one of the most dynamic characters I have ever read, and it is amazing to watch her transform from a self-centered schoolgirl into a powerful leader who listens to others. The first novel, Sea of Shadow, follows Youko Nakajima, a Japanese schoolgirl, as she enters the fantastical world of the Twelve Kingdoms. Unfamiliar with the world and entirely alone after she is abandoned by Keiki, the one who brought her to the world, Youko must fight to survive from the many creatures chasing her, as well as attempt to find her way home. Along the way, Youko discovers her true destiny and grows into an admirable character. I don’t want to spoil too much, so I won’t go into depth about the later novels about Youko. My favorite parts of the series are the novels about Taiki, the kirin of Tai. Taiki isn’t human, and Ono makes it clear that he isn’t, yet she still draws the reader into identifying with him as a character. Sea of Shadow is a good choice for beginning the series, but it is also possible to begin with Demon Child, the first novel published in the series, or Sea of Wind, which explains how Taiki came to the Twelve Kingdoms. Don't feel constrained to keep to the order used in the anime when you begin the series. Demon Child was originally written as a stand alone horror novel, but was later worked into the series. It is told from the point of view of Hirose, a student teacher who has returned to his alma mater to teach before he graduates. On his first day teaching, Hirose notices that one of the students, Kaname Takasato, is different from the others. The other students believe he is cursed, and never speak to him. As Hirose begins to learn more about Takasato, and becomes closer to him, the strange occurrences around Takasato began to strike more fiercely and rapidly towards those connected to him. As Hirose tries to understand Takasato, he begins to identify with him as someone who feels he does not belong in this world. Both Youko’s and Taiki’s arcs coincide in the most recent novel, The Shore at Twilight, The Sky at Daybreak, which explains what happens after the end of Demon Child. If you have any interest in Asian fantasy, ‘another world’ fantasy, or just fantasy with personal growth, you’ll enjoy Juuni Kokuki.